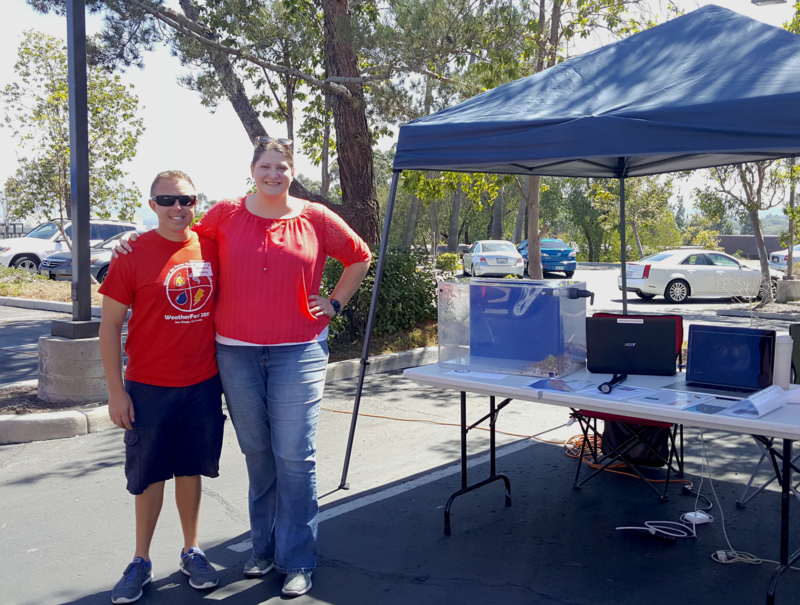 CW3E’s Rachel Weihs and Anna Wilson were on hand at the annual WeatherFest event hosted by the local National Weather Service office in San Diego, CA on September 17th, 2016. WeatherFest is presented by the Young Meteorologist Program and serves as an outreach event informing the general public on weather preparedness, safety, research, and education. Over 600 local weather enthusiasts attended this year’s WeatherFest where they were able to interact with representatives of the National Weather Service, first responders, research institutions, and local newscasters while enjoying games, viewing demonstrations, and gathering information. Dr. Rachel Weihs (left) and Dr. Anna Wilson (right) discussing CW3E’s Research with the publc. The CW3E booth showcased the ongoing research into atmospheric river (AR) events with emphasis on the major contribution of ARs to California’s annual precipitation and their associated impacts on the management of water resources, reservoir flood risk, and drought. Attendees learned about the term “Atmospheric River” by viewing satellite animations of the associated clouds and precipitation during an AR event in December 2014 and referencing the narrow river-like transport of moisture from the tropics using SSMI visualizations. The CW3E booth featured a fully-functioning weather station with state-of-the-art research quality instruments feeding live data into a computer for viewing. 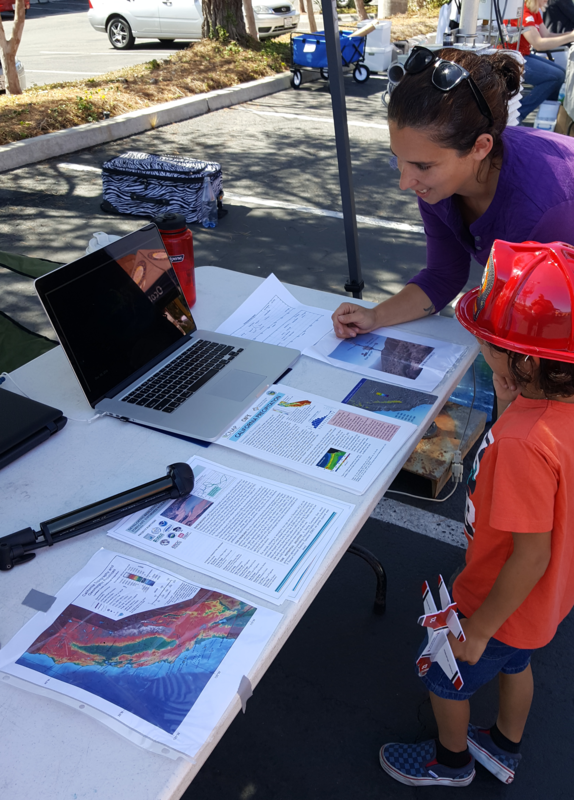 They also provided interactive demonstrations and graphical information highlighting the importance of California’s topography and the influence of orographic lift on the spatial distribution of precipitation. Adult attendees enjoyed comparing the weather instruments on display to those they had at home, talking about storms they had experienced during their lifetimes, and viewing the satellite animations. Kids enjoyed the diorama of the California coastline and simulating rainfall with the tipping bucket rain gauge on the weather station. 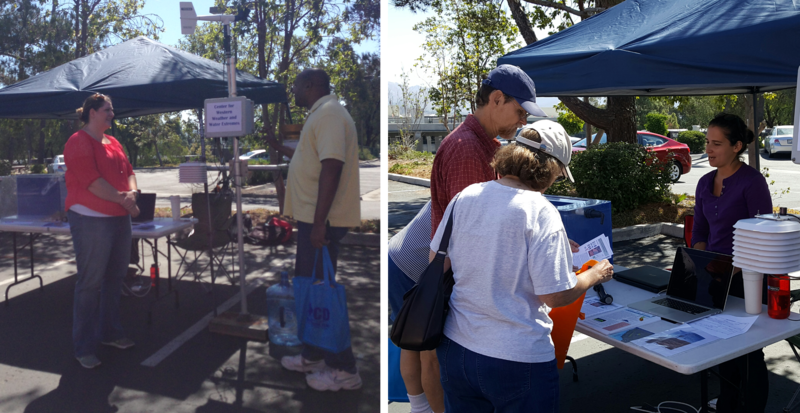 Through these activities, attendees were able to gain a better understanding of ARs and their impact on daily life.